Little House on the Prairie actor Dean Butler, right, and Dale Cockrell, the director of MTSU’s Center for Popular Music, whose vision has taken the music that Laura Ingalls Wilder referenced her father fiddling in her books onto a series of albums, teamed to create Pa’s Fiddle: Charles Ingalls, American Fiddler for PBS. If your knowledge of Pa Wilder, father of author Laura Ingalls Wilder, only comes through Michael Landon’s Little House on the Prairie TV series, little would you know that he was one of the great old-time fiddlers. In more ways than you can shake your bow, Dale Cockrell, director of the Center for Popular Music at Middle Tennessee State University, is doing all in his power to set you straight on the fact, plus provide many of the most beloved songs from 19th-century America. Not only is he releasing the third in a series of 10 albums, but Cockrell has co-produced a PBS special, Pa’s Fiddle: Charles Ingalls, American Fiddler, that airs at 7 p.m. Sunday, June 3, on WNPT-Channel 8. In her eight Little House books, Wilder named 127 songs that her father performed. Via his Pa’s Fiddle Recordings label, Cockrell intends to release them all over the next five to 15 years. The album series, the PBS special and Cockrell’s 2011 The Ingalls Wilder Family Songbook, a scholarly edition of all of the Little House music, germinated in 1997 while Cockrell was reading the Little House books to his then 8-year-old son Sam. “I didn’t start reading the books until Sam came along. We liked to read in bed together and gravitated toward reading series. That took care of what we read next. I thought this would be a fun book series about the American frontier and pioneers, and we were gripped by them. Somewhere around then, I concocted the idea to looking at the music in the books,” recollected Cockrell, a retired Vanderbilt professor of musicology, who has served the past two years as director of the Center for Popular Music at MTSU. “The scholar got the best of me, and I drew up a list and that started the general idea of the project. What Sam and I wanted to do was put in the CD and play the tunes. We wanted to pop something in and hear these songs. Eventually, the professor decided to start his own record label and produce the albums himself. Thus far, the first two CDs have sold 12,000 copies. Getting back to the real Pa Ingalls (1836-1902), Cockrell notes, “Laura said about him that he was more a poet and musician than a farmer. . . . He ended up living in town and having several jobs in the little town of De Smet, S.D. That is where he is buried and pretty much where Laura grew up from 13 years on. Ingalls played his fiddle at all sorts of social occasions as well as for his pleasure and the pleasure of his family. What amazes Cockrell is the breadth of his repertoire. “Except for classical music, there’s just about the whole range of American music represented in those books: Different genres, from a couple of spirituals and fiddle tunes to folk ballads, patriotic songs, Western songs. Whereas today, music is broken into popular categories. Charles Ingalls loved it and knew it all. Today, I can’t imagine somebody loving rap, heavy metal, country music and Southern gospel,” said Cockrell, a native of Paducah, Ky. 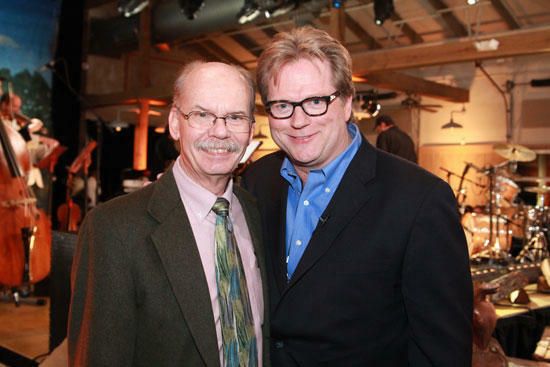 The PBS documentary came about after Cockrell met actor-producer Dean Butler, who from 1979 to 1983 portrayed Laura’s husband, Almanzo Wilder, in the Little House on the Prairie TV series, at the Laurapalooza conference in July 2010 in Mankato, Minn. The two got to talking, wound up pitching their idea to PBS as a pledge drive special concert, and about a year later, it all came together. With musical director Randy Scruggs (son of banjo legend Earl Scruggs), such singers as Randy Travis, Rodney Atkins, Ronnie Milsap, Ashton Shepherd and The Roys, and an all-star string band, the show was filmed in January at the Loveless Barn in Nashville. A bonus resulting from the project is The Making of Pa's Fiddle: The Music of America, which Cockrell cooked up with MTSU’s dean of mass communications. “At the taping there were 20 Middle Tennessee State students with their cameras, their recorders and their booms and everything else, and they were interviewing the artists and taping what was happening. They have put together, with faculty supervision, a spectacular 28-minute documentary about the making of the show, which serves as a prelude to the show. It will be part of the premium package that viewers get if they pledge to PBS during the show,” Cockrell said. Next, the musicologist sets his sights on elementary school students. Pa’s Fiddle: Charles Ingalls, American Fiddler airs at 7 p.m. Sunday, June 3, on WNPT-Channel 8. Dale Cockrell, director of the Center for Popular Music at MTSU, was co-producer. In conjunction with the PBS special, an album of the same title will be released June 5. For more info, go online to laura-ingalls-wilder.com.